The Sindh People’s Local Government Ordinance or 18th Amendment, that was passed by the Pakistan People’s Party fundamentally violates the rights of the people of Sindh. I never thought that Sindh, the land of the legendary Makhdoom Bilawal who preferred pulverisation by the Arghun ruler’s oil seed grinder to submission in 1523 AD (929 AH); where on February 17, 1843 in Miani, 6,000 plus martys, including Mir Jan Mohammad Talpur who was buried there as his wounds made shifting impossible, would see this day when it would capitulate to selfishness and abandon the rights of Sindhis just to retain their privileges. The Pakistan People’s Party (PPP) has done just that by passing the Sindh People’s Local Government Ordinance 2012 in an indecent haste. The perfidious ordinance sounds the death knell for Sindhis’ rights by giving the Muttahida Qaumi Movement (MQM) the unchallenged right to rule urban Sindh and confines Sindhis to rural areas. The ordinance is unadulterated mischief because only the First Schedule has been published yet, and it is mischief personified, while all other schedules still under wraps must certainly carry more trouble and harm. The people of Sindh are resisting this perfidy but it seems the PPP government and party is bent upon inflicting this deadly wound on Sindh, bartering away its destiny. This skewed ordinance weakens the already emasculated provincial government by creating the Metropolitan Corporation with Mayoral office, which in many respects is more powerful than the chief minister and his ministries. That would thus create a diarchy but not a simple diarchy for as per the ordinance, the urban local government has untrammelled powers in cities where the gerrymandered constituencies and bogus elections ensure that the MQM has the sole right to rule while the rural areas where decrepit governance prevails, languish. Under this ordinance, the mayor with unbridled powers heads the Metropolitan Corporation with its separate bureaucracy under a Chief Officer, chosen or requisitioned by him. His autonomy from the provincial government in matters of administration, planning, allocation, taxation, supervision, audit, budgeting, works, communication, environment, transport, works, execution, inspection, enforcement, etc, will create a parallel power centre. He enjoys some magisterial powers plus Section 144 CRPC. His removal requires a two-thirds majority; the mover/seconder loses his seat if the motion fails. Even if he is prima facie guilty of transgressing laws, the chief minister cannot remove him but refers to the Provincial Local Government Commission with a 90-day inquiry deadline. A mayoral autocracy will thrive in the name of democracy. The NFC Award, supposedly the guarantor of fiscal independence, has been nullified by this ordinance. Its section 124 establishes a Provincial Finance Commission, headed by the provincial finance minister and ‘shall comprise of such other members as may be prescribed, and would recommend the distribution of funds between the provincial and local governments on the basis of such vague, subjective and potentially contentious principles as “fiscal need, fiscal capacity, fiscal effort and performance.” The finance portfolio will not be difficult for the MQM to pry away from the spineless PPP government. It ensures perpetual deprivation for Sindhis and hostility along the ethnic fault lines. The 18th Amendment had ostentatiously devolved powers to the provinces but the First Schedule of the new ordinance reintroduces a hybrid concurrent list in Sindh. 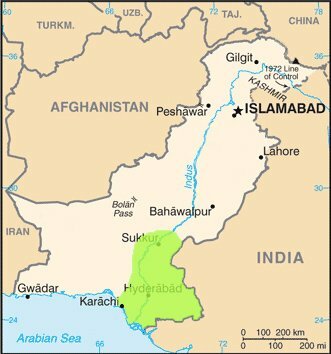 That will allow the metropolitan areas, particularly Karachi and Hyderabad, to exercise almost the same range of powers and functions as are enjoyed by the provincial government, thus accentuating the urban-rural divide for all intents and purposes. This means that the urban centres will be ruled at the whim of the MQM muscled in by bogus elections. Under an unfettered MQM rule, they will become increasingly active and dangerous. The warped ordinance will allow the MQM to forge laws and create conditions that will exclude people of other ethnicities from all political and economic benefits and force them into ghettoes in the cities it will control. The rural areas as it is receive only crumbs from the urban rulers. This inequitable ordinance creates conditions for political and economic apartheid for all ethnic groups with the exception of urban muhajirs and this is the first systematic step for creating ‘Bantustans’ for Sindhis in Sindh so that the indigenous Sindhis do not even get half a chance to progress. Bantustans, the black homelands, were created by the South African apartheid regime to ensure that the blacks and coloureds were excluded from all benefits that the whites enjoyed. These Bantustans were a major administrative device for the exclusion of blacks from the South African political and economic system under the policy of apartheid. The new ordinance in Sindh follows Hendrik Verwoerd’s apartheid policy principle known as “separate development”. It will ensure that the development in rural, read Sindhi, areas will be condemned to absolute neglect. The Bantustans of rural areas here under the ordinance are a double whammy for Sindhis as it benefits the MQM by making cities Pretoria and Johannesburg for them; and secondly, making the rural areas Vendaland, Transkei, Kwa-Zulu, etc, for Sindhis, thus depriving them of their rights and opportunities and keeping them mired in the Middle Ages. This ordinance creates the optimum conditions for dividing Sindh between the Urdu-speaking and Sindhi-speaking people, initiating a perpetual conflict between them. The PPP in its anxiety to retain power has recklessly forsaken Sindhis and agreed to the Bantustanaisation of Sindh. This ordinance will exacerbate the already acute ethnic conflicts. Inevitably, along the existing ethnic fault-lines, tectonic scale fissures will appear and result in an irreversible ethnic and social meltdown because when a single ethnic group pockets all the rewards and the rest are denied even the basic essentials, there is bound to be unprecedented turmoil. It carries the germ of division and can only result in violence. During the civil war in Cyprus, the Greek and Turkish populations generally inhabited separate areas while here they intermingle, which means more bloodshed. There however is a glitch in this plan. The people of Sindh have realised that their rights have been bartered away for personal benefits by the PPP and MQM and its beneficiaries stand to prosper further, therefore they are bravely resisting the attempt to permanently consign them to ghettoes. They have to understand, if they have not yet, that once they are corralled in their Bantustans there is no escape because they have neither a Nelson Mandela nor an ANC to lead them. They will have to man the barricades for the salvation of Sindh and Sindhis themselves.